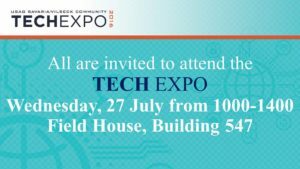 GRAFENWOEHR, Germany — The USAG Bavaria Vilseck Community Tech Expo hosted by the JMTC G6, will be held Wednesday, July 27 from 10 a.m. to 2 p.m. at the Field House, Bldg. 547. All military, civilian and contractor personnel are invited to attend for free! To pre-register, please visit www.FederalEvents.com, click on USAG Bavaria/Vilseck Community and select the Pre-Register button. Satellite Communications, Ruggedized Equipment, Dynamic Encryption Threat Defense, Cyber Security, IT Security Training & Certification, Data Mapping & Mining, Open Source Software, Access Control & Physical Security, AV Control Systems, Storage Solutions, Field Deployable Power Supplies, Virtualization, Cloud Computing, Optical Equipment, Digital Imaging, and Many More! Customize YOUR Expo – tell us what technologies YOU want to see! Share the experience by bringing a colleague! Complimentary refreshments and giveaways will be available while supplies last. For more information or to suggest a company or a technology, please call Heather Russell at 001-443-561-2438 or email Russell@ncsi.com.